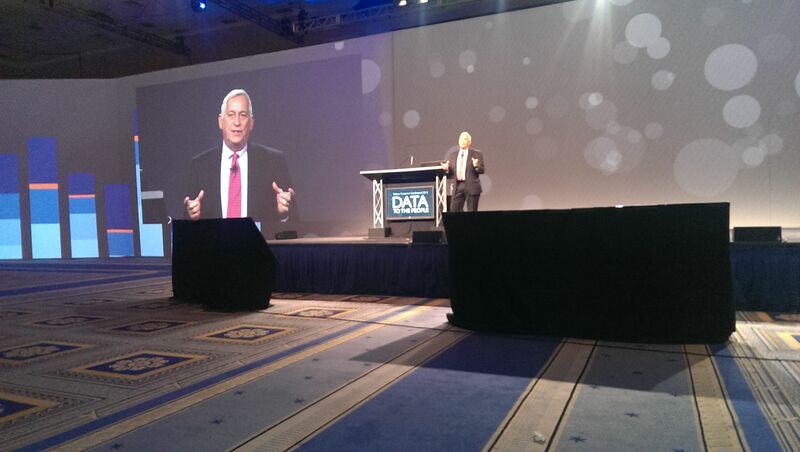 Today Biographer Walter Isaacson joined Tableau Customer Conference 2013 for a keynote. He talked through his three biographies and put forth that Jobs, Einstein and Franklin were similar in that they knew "intuition only works when it's informed by data." As Isaacson's began discussing Steve Jobs, fittingly, Apple was making a product announcement about the iPhone 5. Jobs "was a person of imagination who connected beauty to technology." When Isaacson was writing the Jobs biography, he and Jobs would take walks around the neighborhood where Jobs grew up. They looked at the fence Jobs and his father built. Jobs made Isaacson look at the back of the fence and noted how it was done as well as the front, even though no one could see it. His dad told him that a true artist makes the whole product beautiful. Later in life, Jobs had all the engineers of the original Mac team sign their names and had those signatures engraved inside the case. "True artists sign their name," said Jobs. When Einstein was 6 his father gave him a compass. Einstein marveled that no matter where he moved, the needle pointed north. Even with nothing touching it it would point that way. And Einstein wondered for days why a force field could move an object. After going to university and failing to get any university jobs, Einstein became a low-level patent clerk. He was in this position when he published his paper on the special theory of relativity. Einstein knew the entire field before he thought outside of it. Benjamin Franklin discovered and documented the gulf stream as a 17 year old crossing the Atlantic. He was characterized by passionate curiosity. More so than Isaacson's other two subjects of biography, Franklin believed in kindness and tolerance. That the diversity he found in Philadelphia, versus the more traditional Boston of his home, was important. The lessons of these three men was to use intuition and data together to do great work, Isaacson said. The crowd of data geeks was with him every moment and seemed to love the hour of stories about great thinkers.